What a well informed bunny will be delivering this Easter Sunday. Easter is almost upon us, and this year it is going to be an eggstravagansa!! (Forgive me). 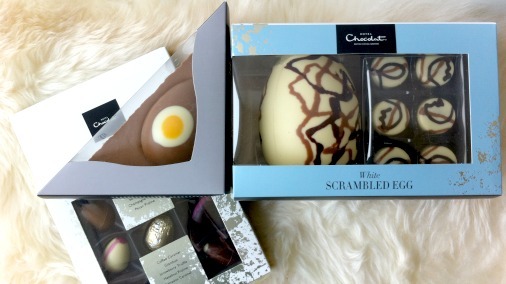 The finest chocolatiers in the land have been whipping up a veritable egg storm of truly delicious things for you. Or rather for the Easter bunny to gather and send in your direction. Just make sure the bunny gets a good look at your conveniently placed computer screen, open to this page. You don’t want substandard Easter offerings. There are of course bunnies and chicks. Rococo has the coolest imaginable Jazz Musician rabbits around. But the egg dominates this year. It may be simple, but it is a very useful shape for filling with all manner of ganaches and caramels, and if the chocolate is good, why wouldn’t you? A little box of paradise from Rococo. 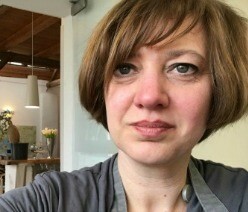 For all manner of reasons, Barry Johnson’s work for Chantal Coady at Rococo invites my admiration and brings great pleasure. Their caramels are a thing of joy. 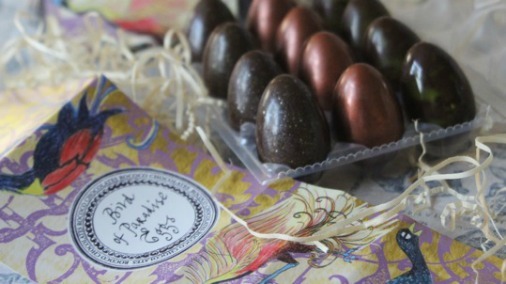 In this Birds of Paradise Eggs box they are reworked into delightful little eggs for the season. Yes please Mr Bunny! 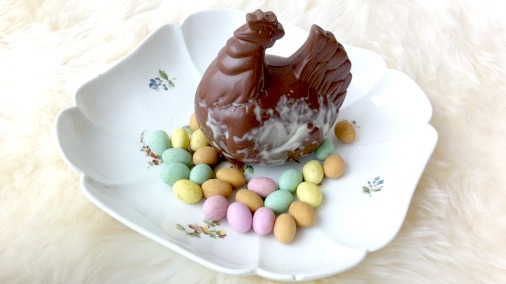 Stylishly delicious hot x eggs from Marc Demarquette. A little masterclass here from Marc Demarquette. Two each of three delicious flavours. Strawberry and Passionfruit caramels are each encased in milk chocolate, the Cornish Sea Salt caramels are in a 71% dark. All three are quite scrumptious. I know there are two of each, but that doesn’t mean you have to share. Crowd pleasing without compromise from Chococo. 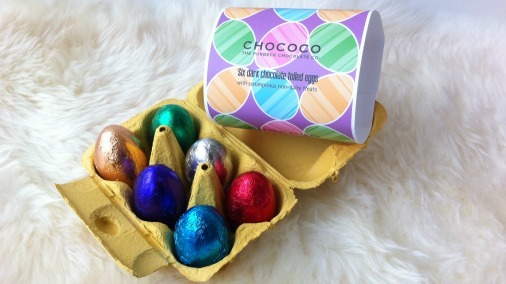 Chococo consistently make seasonal gifts that deliver on both quality of chocolate and the fun factor. I never stop recommending them to friends who care about what they are buying and eating, but with kids to please. You do not have to be a kid to want them, but it guaranteed that they will. Their contents rattle pleasingly, and they come in dark or milk chocolate. Mine, which were dark (and therefore the whole is dairy free), had two with jelly beans, two with chocolate covered cocoa nibs, and two with dark chocolate chips. A break here from eggs, almost, a mother hen and her eggs. This is Myrtle the Mottled Hen, who is 43% milk chocolate and protects a brood of naturally coloured milk chocolate mini eggs. A Chococo newcomer, the dark nib egg. Chococo big eggs are pretty special, in past years I have reviewed their famous Dorset Dinosaur, whose belly holds the glorious collection of the pre-historic. This year they have a fabulous new robot creation. All Chococo things use chocolate you will want to eat, but for the most seriously dark amongst you this new cocoa nib egg would be the thing. It is made of 67% dark Madagascan, and opens to reveal columbian cocoa nibs. 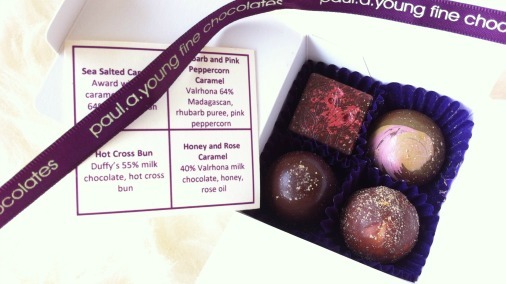 An Easter mini collection, from Paul A Young. Paul has gone large on the hot cross bun this year, for which I am punching the air with glee! I adore hot cross buns, so what is not to love. This little collection box above contains the hot cross bun truffle. It has Duffy’s 55% dark milk, ensuring the chocolate flavour gets a proper look-in. The rest is a tender, creamy, sweetly spiced delight. 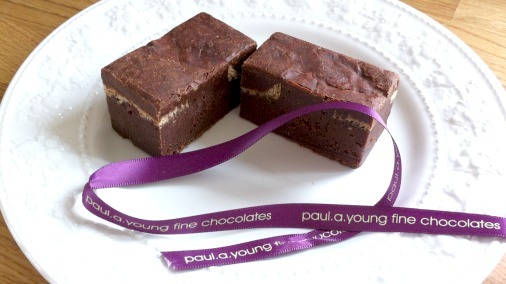 Brownie/Hot X Bun hybrid from Paul A Young. The hot cross bun brownie is a happy mash up. There are slivers of bun in the mix, and the flavour of the buns accordingly. It is more brownie than bun, but the malt loaf quality the buns give to Paul’s trademark fudgey brownies is very welcome indeed. My personal favourite of Paul’s hot cross bun bonanza is the jar of caramel. This is absolutely made for spreading on a bun, hot crossed if you like, but it would also be stupendous on a scone, or five. It has become something of a necessity to have the salted caramel at a cream tea, I think this is an even better option. Not that there is anything lacking in the salted caramel, but that is all very Breton in origin. And why not take a break from anointing your scone with something French instead opt for this perfectly British affair. It is buttery, unctuous, as full of nostalgic tea time flavour. One to watch, a very promising beginning. 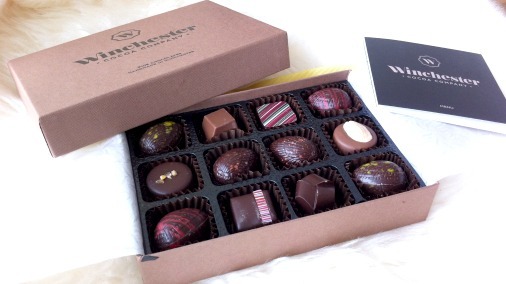 New to me, and very exciting, are Winchester Cocoa Company, the brainchild of the talented chocolatier Chris Attewell. I have come to regard an arrival of a box of his chocolates with joyful anticipation. 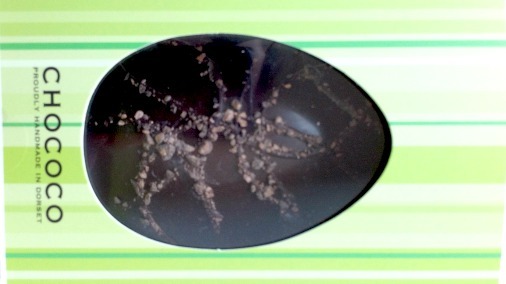 His Easter offering is three special new eggs, as seen at the top of this piece. One is a buttery caramel with a happy hint of salt, the crisp fine dark shell has enough spice and fruit to give it a warm darker ending. The strawberry and balsamic ganache contains just enough of the fruit and balsamic to ramp up the fruit and acidity of the dark chocolate it is made with. 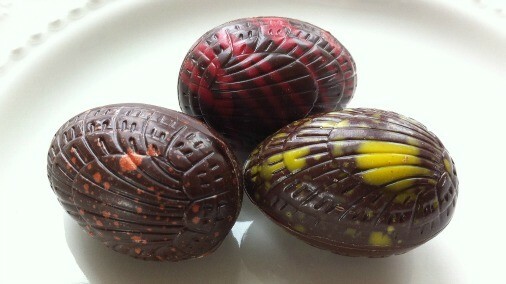 The final egg is a passionfruit ganache, very zingy and fresh, well balanced and quite delicious. A very successful selection from the new kid on the block. 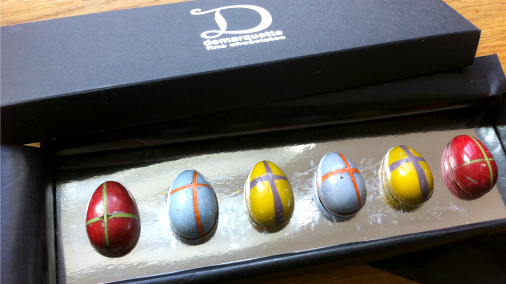 The eggs sat within a selection box, and I was charmed by the style and flavours of all the chocolates within. 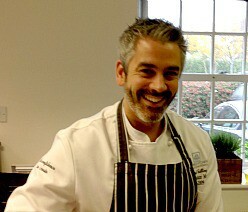 Chris uses Felchlin couverture, and fresh ingredients, in interesting, easy to love recipes. 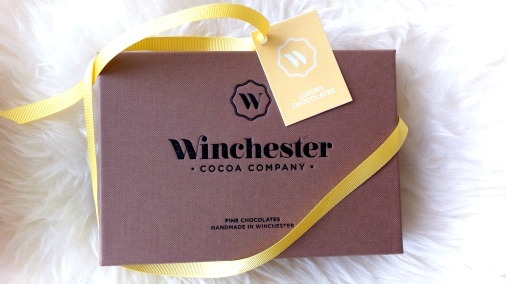 I will be trying more, and bringing you more on Winchester Cocoa Company in the future. The goose that laid the golden egg, it’s a Fairy Tale. Another independant I saw start a few years ago is Fairy Tale Gourmet, this time aiming at making tasty and quirky chocolate gifts and desserts. It’s founder Armand Falco was clearly passionate about what he was trying to do. 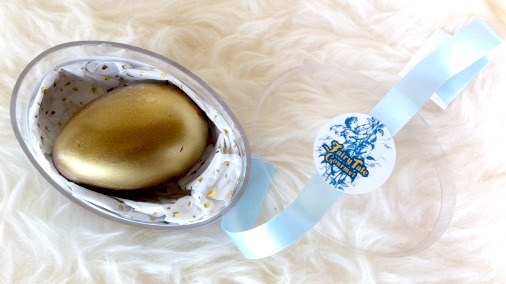 I was therefore charmed to receive this golden egg, very fairy tale worthy. Who’d a thunk it? 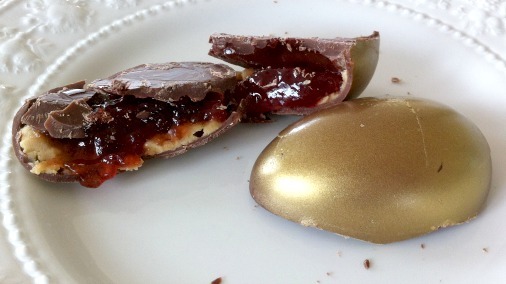 The golden egg is PB&J. The packaging is strong and elegant, it looks the part. I love the combination of peanuts and chocolate. I wasn’t sure what to expect here as Armand had told me that they had changed the couverture he was using from when I last tasted. The chocolate here isn’t as good as I would wish it to be, because everything else is simply charming, and very well done. But the peanut butter and jelly filling is a total bomb of indulgence. Elvis would approve! 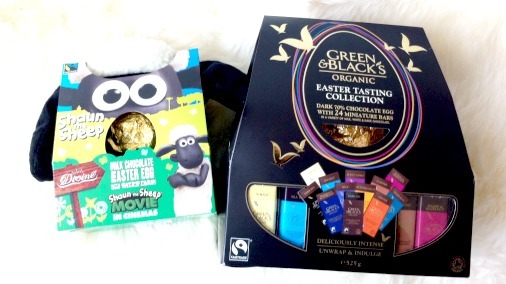 Supermarket options from Divine and Green & Blacks. 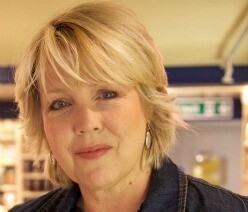 And I do get it that sometimes things are bought as a last dash, or the supermarket is the only option for shopping. If that is the case these might suit. If you buy something from Divine, or Green & Blacks, you are buying from a company doing something to support cocoa farmers. It is however the case that where Fairtrade works for some crops and farming communities, for others it is less effective. I have an upcoming interview with the head of a major cocoa farming initiative to let you know more about how it all works for cocoa. On the high street, we have Hotel Chocolat, whose offering truly does cover all bases. They are doing great things to give every chocolate eater in the land something they will love, in addition to making sure they know where it comes from. And how witty is this Egg Sandwich!? A caramel filled, milk chocolate, crowd pleasing little delight. 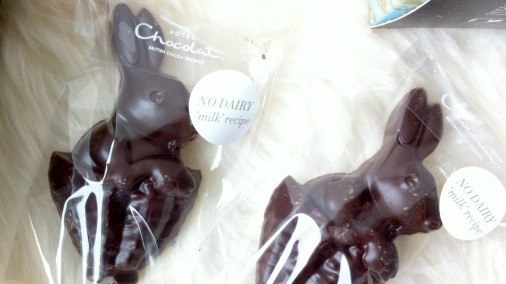 Their new no dairy ‘milk’ chocolate has been made into these cute bunnies. This is a chocolate made with almonds, to reproduce the mellower cocoa hit of a milk chocolate, but without the dairy. So if you have someone lactose intolerant they might suit. 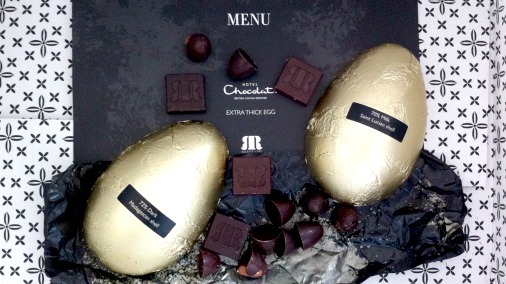 Rabot Estate Extra Thick Egg, from Hotel Chocolat. For me the chocolate Hotel Chocolat are making for their Rabot range is worth keeping an eye on. They are working with various origins and this generous egg gives you much to choose from. One half of the shell is a fruity, smoky, 72% dark Madagascan, the other half is a 70% St. Lucian milk, barely sweet, and mellow with notes of almond. The chocolates inside range from the 100% St Lucia, cut with candied lemon peel, which is a proper pick-me-up, to the Vietnam Cherry, a spicy, plummy 80% dark chocolate from the Mekong Delta paired with well matched dried fruits. 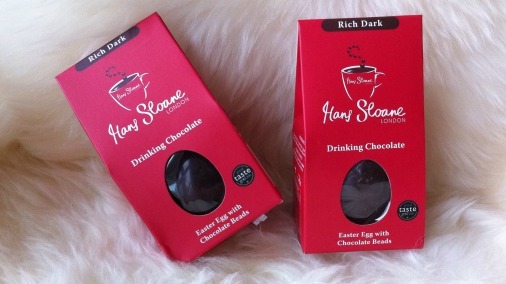 Hot chocolate eggs, from Hans Sloane. Last but not least, because not everyone deserves or can stretch to a mega egg, how about these little beauties. Each egg is filled with lovely rattley chocolate beads, and when the whole is immersed in a mug of hot milk or water, hey presto hot chocolate! They are only £2 each, so the Easter equivalent of a stocking filler. Most things above can be bought online, Paul A Young’s things from his four shops. But if you have the time and the inclination to chocolate shop in style, The Easter Chocolate Festival will thrill. And Paul’s Camden Passage shop is next door too. Hans Sloane, Rococo, Demarquette, and the brilliant Damian Allsop will be there, among others. Whatever graces your breakfast table on Easter morning, and warms your belly later in the day, I hope it is what you wished for.